Occasionally I see an image that turns on a light and helps illuminate an artist's way of seeing quite concisely. Fittingly, an illumination is one of them. The best book ever written on self-portraiture is probably Joseph Leo Koerner’s The Moment of Self-portraiture in German Renaissance Art (1993).1 In it, though, Koerner compares Dürer’s 1500 Self-portrait as Christ to Matthew Paris’ self-portrait, above. 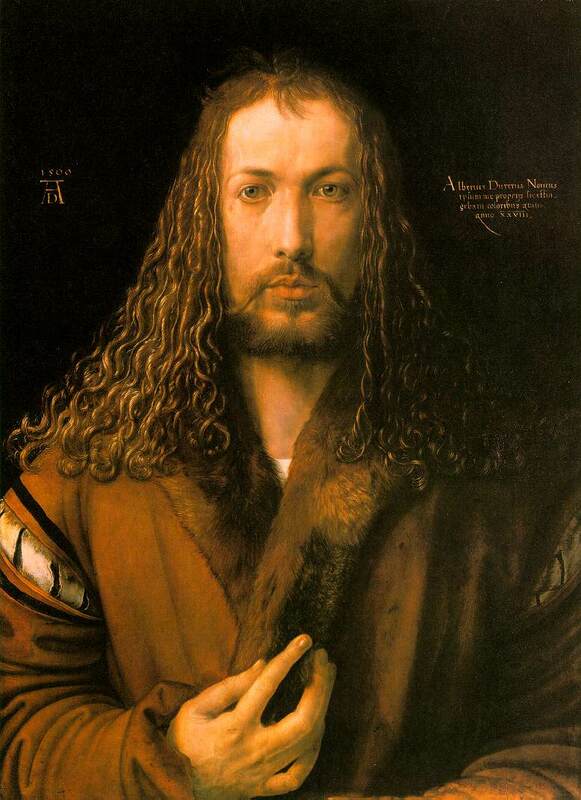 (To see Dürer's Self-portrait, click here.) Koerner juxtaposes the two images in writing that Dürer "leaves behind centuries of image production in which authorship either was not registered or else was framed in postures of submission, as in the self-portrait of.. ...Matthew Paris crouched beneath the Virgin in the bas-de-page.” He suggests that the two images are quite different. I do not see it that way at all because Paris offers a very similar message for those that can see. Let’s take another look. The medieval artist is in a roughly horizontal position, his knees tucked in under his torso, with his hands and arms extended in front of him. The infant Christ is also cloaked, his knees tucked in under his torso in the same manner, his hands also extended in front of him. The infant Christ and artist on this page share the same form thereby suggesting a similar message, that Paris, like Dürer, is Christ-like. Form, you should keep in mind, has meaning and a borrowed form borrows meaning. Dürer’s message may be much bolder than Paris' but, on closer observation, not much different. Both saw themselves as Christ.